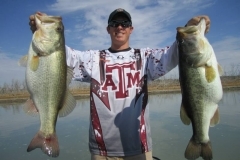 Texas freshwater bass fishing reports. ALAN HENRY Water lightly stained; 64 degrees. Black bass are fair on dark jigs and live bait near timber and points. Crappie are fair on minnows and jigs. AMISTAD Water fairly clear; 71 degrees. Black bass are fair on watermelon seed, watermelon seed/red, and chartreuse topwaters and spinnerbaits in 5 – 20 feet. Striped bass are slow. White bass are slow. Crappie are slow. Channel and blue catfish are good on cheesebait over baited holes in 30 – 50 feet. Yellow catfish are slow. ARROWHEAD Water muddy; 61 degrees; 1.2′ low. Black bass are fair on spinnerbaits and soft plastics near flooded brush. Crappie are good on minnows near the derricks about 17′ and Scotland Bridge, and fair near State Park. White bass are excellent on shad-imitation baits with some topwater action late in day. Blue catfish are good on cut shad and prepared baits. ATHENS Water clear, 67-73 degrees; 3.5′ low. Black bass are good on topwaters and Rat-L-Traps early, switching to Carolina rigs later in the day. Crappie are good on live minnows in 15 feet around man-made brush piles. Catfish are good on fresh shad and punch baits around in 6-12 feet. BASTROP Water clear. Black bass are very good on watermelon/blue fleck and watermelon/silver fleck soft plastic worms, and on white spinnerbaits and crankbaits. Crappie are fair on minnows and blue and green tube jigs. Channel and blue catfish are good on shrimp, cutbait, nightcrawlers, and stinkbait. Yellow catfish are slow. BAYLOR Water lightly stained; 69 degrees. Black bass are slow. Crappie are slow. Catfish are slow. BELTON Water murky; 68 degrees; 1.26′ low. Black bass are excellent on blue/white topwaters and on soft plastic worms and lizards. Hybrid striper are slow. White bass are fair on slabs, striper jigs, and minnows. Crappie are very good on minnows and white-tailed jigs. Channel and blue catfish are fair on shrimp and stinkbait. Yellow catfish are slow. BOB SANDLIN Water clear; 68-73 degrees; 5′ low. Black bass are good on topwaters over main lake grass beds and Carolina rigged french frys or centipedes on main lake points in 6-12 feet. Crappie are good on live minnows under the railroad bridge. White bass are good on Pop R’s early and slabs during the day. Catfish are good on punch bait in 10-20 feet in baited holes. BRAUNIG Water stained; 88 degrees. Black bass are slow on dark worms in reed beds. Striped bass are slow. Redfish are fair on crawfish and perch. Channel and blue catfish are fair on liver, shrimp, and shad. Yellow catfish are slow. BRIDGEPORT Water clear; 67-72. Black bass are good on red shad worms and shad pattern Rat-L-Traps along rock riprap, docks and brush piles. Crappie are good on chartreuse/black jigs and small minnows around main lake brush in 15-20 feet. White bass are good on Rat-L-Traps and slabs in 15-20 feet in the mid to lower lake. Hybrid striper are fair on live shad in 12-20 feet flats close to channels. Catfish are good in 15-20 feet on punch bait over holes baited with soured grain. BROWNWOOD Water clear; 60 degrees; 1.49′ low. Black bass to 4.5 pounds are excellent on red bug Ghost Baits 6″ slam worms, perch and shad colored Persuader Stealth shad crankbaits, and Strike Works jigs around docks in 8 – 15 feet. Hybrid striper are slow. White bass are fair on silver spoons, crankbaits, Li’l Fishies, and small tubes under lights. Crappie are fair on small tube jigs and minnows in brushpiles in 18 – 20 feet. Catfish are slow. BUCHANAN Water clear; 74 degrees; 6.60′ low. Black bass are good on white Terminator buzzbaits, Tennessee Shad Pop R’s, ¼oz. 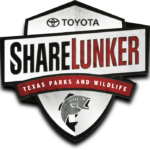 Bleeding Shad Rat-L-Traps, and Texas rigged green/pumpkin Whacky Sticks on bluff ledges and break lines of points in 3 – 10 feet. Striped bass are fair drifting live bait and casting 3″ Spoiler Shads, Rattlin’ Rogues, and white bucktail jigs through surfacing schools in 20 – 30 feet. White bass are fair on ¼oz. Perk Minnows and Li’l Fishies on jigheads along main creek points. Crappie are fair on minnows over brushpiles in 8 – 15 feet. Channel catfish are fair to good on live bait. Yellow and blue catfish are fair on live bait. BUFFALO SPRINGS Water lightly stained; 61 degrees. Black bass are fair on minnows. Crappie are fair on silver minnows near Crappie House. Hybrid strippers are good on silver shad near dam. Channel catfish are good on stinkbait near docks and chicken liver near Crappie House. CADDO Water clear; 68-72 degrees; 1.30′ low. Black bass are good on plastic worms and topwaters along the edge of lily pads and isolated cypress trees in 3-8 feet. White bass are good in the main channels on small spinners, spoons and slabs. Yellow bass are excellent on small bits of minnow along the Cypress River channel. Channel catfish are good on punch bait in 6-10 feet along the river channel. CALAVERAS Water stained; 86 degrees. Black bass are slow. Striped bass are slow. Redfish are fair on perch and tilapia, and on spoons and Rat-L-Traps in 15 – 30 feet. Channel catfish are good on liver, shrimp, and nightcrawlers. Blue and yellow catfish are slow. CANYON LAKE Water clear; 77 degrees; 1.61′ low. 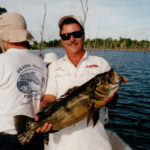 Black bass are very good on white Terminator buzzbaits and spinnerbaits, and Daiquiri Skip-N-Pop topwaters, along break lines of flats in 2 – 8 feet, and on watermelon Craw Tubes and green pumpkin Scoundrel worms on jigheads in standing timber in 12 feet. Striped bass are slow. White bass are slow. Smallmouth bass are good on Smokin’ Green Devil’s Tongues on drop shot rigs along ledges of points and around rock piles in 5 – 15 feet, and on root beer 4″ Strike Grubs and 4″ hard jerkbaits over shallow rock piles. Crappie are fair to good on minnows tight to trees and brushpiles in 8 – 10 feet upriver. Channel catfish are fair on large minnows at the mouth of the river. Yellow and blue catfish are slow. CEDAR CREEK Water stained; 68-72 degrees; 3.40′ low. Black bass are fair on Rat-L-Traps and Carolina rigs in 8-12 feet – soft plastics working best around concrete structures. White bass are excellent on white or chartreuse slabs around humps on the west end of the lower lake. Hybrid striper are good on Sassy Shad and live bait in 12-20 feet in the lower lake. The topwater bite is good on cloudy days. Crappie are good on jigs and minnows under the bridges and around boat docks with brush in 6-10 feet. Catfish are excellent on prepared catfish bait in 18-22 feet around holes baited with soured grain – good catches also made around shallow, windblown banks. pounds are good on chartreuse Reaction Innovations Swamp Donkeys and chartreuse blue Jackall Bonnie 128’s on main lake points in 2 – 8 feet early, and later on 1oz. 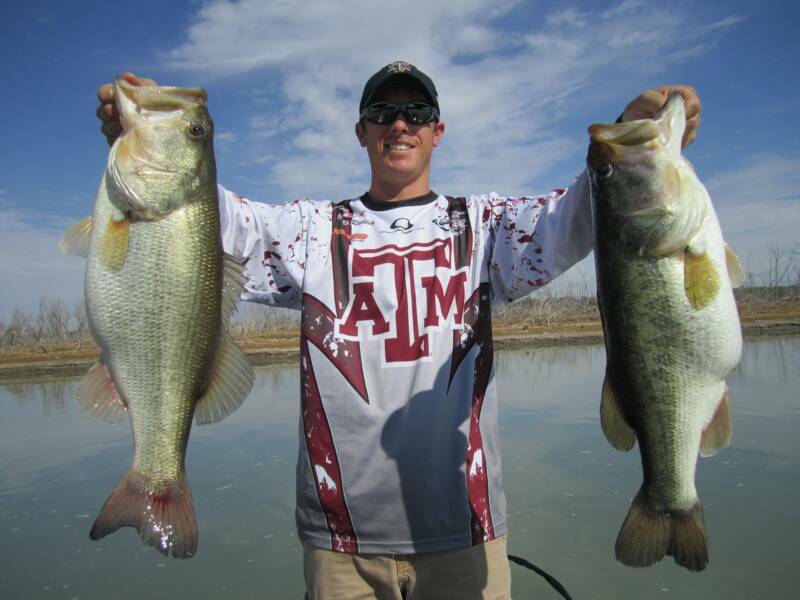 Tungsten Texas rigged PB&J 4.5″ YUM Craw Papi’s and delicious double wide beavers in the grass in 6 – 12 feet. White bass are fair on live minnows and vertically jigging blue Fle-Fly slabs around main lake points in 5 – 10 feet. Crappie to 2 pounds are good on live minnows and black/red neck Curb’s crappie jigs tipped with live minnows over brushpiles and standing timber in 6 – 15 feet. Channel and blue catfish to 7 pounds are fair on cut shad, Lewis King punchbait, and perch in 8 – 15 feet. Yellow catfish to 30 pounds are fair on trotlines and juglines baited with hybrid bluegills. COLEMAN Water clear; 75 degrees; 1.06′ low. Black bass are slow. Hybrid striper are slow. Crappie are fair on minnows and blue/red tube jigs. Channel and blue catfish are good on live bait and cutbait. Yellow catfish are fair on trotlines baited with live perch. COLETO CREEK Water clear; 77 degrees (87 degrees at hot water discharge); 1.79′ low. Black bass are fair on grubs and soft plastic worms and lizards over grass beds in 5 – 6 feet. Striped bass are slow. White bass are slow. Crappie are slow. Channel and blue catfish are slow. Yellow catfish are slow. COLORADO CITY Water clear; 74 degrees. Black bass are slow. Crappie are slow. White bass are slow. Redfish are slow. Catfish are slow. COLORADO RIVER (At Colorado Bend State Park) Water stained. Black bass are slow. Striped bass are slow. White bass are slow. Crappie are slow. Catfish are fair on cut shad, nightcrawlers, shrimp, and perch. CONROE Water fairly clear; 3.82′ low. Black bass are fair on pumpkinseed/red crankbaits and spinnerbaits, and on white Rat-L-Traps. Striped bass are fair on white/green striper jigs and soft plastics. Crappie are fair on live minnows. Catfish are fair on shrimp, nightcrawlers, and cutbait. COOPER Water stained; 67-72 degrees. The lake is very low. Boaters should run at slow speed and use extreme caution. Black bass are good on plastic worms fished around standing timber adjacent to creek channels – some schooling occurring in the flats close to creek channels. Crappie are fair on minnows and Betts Jigs in 15-20 feet around timber and submerged brush piles. Catfish are excellent on punch bait, worms and fresh shad in 6-15 feet close to channel ledges. White bass are fair on jigging spoons in 18-20 feet in the lower lake. DUNLAP/MCQUEENEY Water stained; 75 degrees. Black bass are good on chrome/blue and white/blue Rat-L-Traps, striper jigs, and soft plastics upriver under docks near the channel in 10 – 20 feet. White bass are slow. Crappie are good on live minnows and chartreuse/white crappie jigs. Channel and blue catfish are good on cutbait, nightcrawlers, and shrimp upriver in 15 – 20 feet. Yellow catfish are fair on juglines baited with live perch in 10 – 20 feet. FAIRFIELD Water clear; 70-90 degrees. Black bass are good on topwaters around main lake points with grass early, switching to deep diving crank baits and Texas or Carolina rigged soft plastics later in the day. Redfish and hybrid striper are fair on live shad or perch fished under balloons. Catfish are good on freshly caught shad and prepared baits in 18-20 feet. Bream are good on worms in 6 feet around brush and lay down logs. FALCON Water murky north, clear south; 76 degrees. Black bass are good on Brush Hogs off brushy points in 10 – 18 feet. Striped bass are slow. Crappie are slow. Channel and blue catfish to 30 pounds are excellent on stinkbait and frozen shrimp. Yellow catfish are slow. Mexican fishing licenses and boat permits are required to fish in Mexican waters. Everyone in the boat must have a Mexico Fishing License whether fishing or not. FORK Water clear 69-72 degrees; 3.55′ low. Black bass are excellent on Carolina rigs with watermelon seed french frys, wacky worms or junebug finesse worms along the edge of main lake grass beds. Channel catfish are excellent on Danny King’s Punch Bait in 20-22 feet around holes baited with soured grain. Crappie are good on live minnows and red/white jigs in 22-28 feet around brush piles near the mouth of major creeks. FT. PHANTOM HILL Water clear; 73 degrees; 4.35′ low. Black bass are slow. Crappie are fair on minnows and jigs. White bass are fair on live bait. Catfish are fair on prepared baits. GIBBONS CREEK Water fairly clear. Black bass are fair on watermelon crankbaits, spinnerbaits, and Rat-L-Traps. Crappie are fair on minnows and green/white fleck tube jigs. Catfish are fair on cutbait, doughbait, and frozen shrimp. GRANBURY Water stained; 0.39′ low. Black bass are good on chartreuse/white and chartreuse/green soft plastics, spinnerbaits, and crankbaits, and on minnows. Striped bass are slow. White bass are fair on minnows. Crappie are good on minnows and pink and white tube jigs. Catfish are good on frozen shrimp, live bait, and cutbait. GRANGER Water murky; 64 degrees; 0.23′ low. Black bass are slow. White bass are slow. Crappie are fair on jigs tipped with Berkley Crappie Nibbles in 12 – 15 feet. Blue catfish are good on jug lines baited with fresh shad. Yellow catfish are fair on trotlines. GRAPEVINE Water stained; 68-74 degrees; 5.30′ low. Black bass are fair to good on medium diving crankbaits and drop-shot rigged Devil’s Tongues in 6-12 feet off points. Crappie are good off the docks on live minnows in 15-20 feet. White bass are good on slabs and jigging spoons around humps and points in 15-25 feet. Catfish are good on punch bait and fresh shad in 15-20 feet around baited holes. GREENBELT Water lightly stained; 63 degrees; 21.2′ low. Black bass are fair on slow rolled white spinnerbaits and dark jigs fished tight to timber and rocky points. Crappie are good on jigs and minnows. White bass are good on live bait and crankbaits. Smallmouth bass are fair on crankbaits. Walleye are fair on jerkbaits or minnows. Catfish are good on minnows. HOUSTON COUNTY Water stained; 69 degrees; 0.61′ low. Black bass to 5 pounds are fair on Yellow Magic shad topwaters off points and over brush on the north side of the lake in 10 feet. Crappie to 1 pound are good on live minnows and chartreuse jigs over brush near the dam in 20 feet. HUBBARD CREEK Water lightly stained; 70 degrees; 9.35′ low. Black bass are fair on small crankbaits along rocky points with some topwater action early and late in day. Crappie are good on minnows and jigs. White bass and hybrid striper are fair on live bait. Catfish are fair on prepared baits. submerged grass, later switching to Rat-L-Traps and Carolina rigged worms around submerged structure in 15-18 feet. Crappie are fair on jigs and minnows around the barges and Corps of Engineers brush piles in 15-20 feet. White bass are good early on Holiday Slabs in 20 feet around main lake humps and ridges. Channel catfish are good on Bill’s Bait and fresh shad around baited holes in 12-15 feet. LAKE O’ THE PINES Water stained; 67-72 degrees; 3.35′ low. Black bass are good on topwaters and red shad worms with ¼ oz. weight around stands of lily pads and standing timber along creek channels. Crappie are fair on minnows around man-made brush piles in 12-20 feet. White bass are fair around lower lake ridges on shad-pattern Rat-L-Traps. Channel catfish are good in 20 feet on prepared baits in baited holes. Flatheads in the 20-30 pound range landed on trotlines with live perch in 15-20 feet along submerged channels. LAVON Water stained; 67-72 degrees; 9.40′ low. 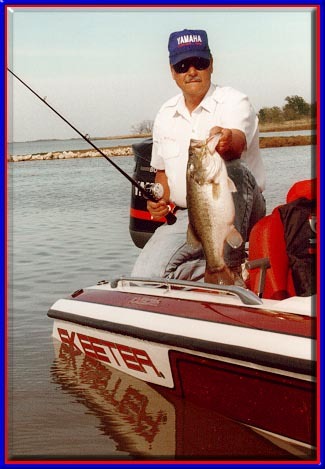 Black bass are fair on Texas rigged worms and Rat-L-Traps around shoreline brush in 6-8 feet. Crappie are good on live minnows and 1/16 oz. red/white jigs in 15-18 feet around brush and standing timber. White bass are fair on slabs and jigging spoons in 15-20 feet. Catfish are good on punch bait and fresh shad in 15-20 feet around baited holes. LBJ Water stained; 74 degrees; 0.10′ low. 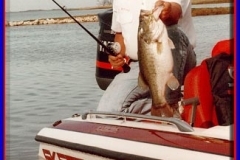 Black bass are very good on white/chartreuse Terminator buzzbaits and spinnerbaits, blue back Bleeding Shad Rat-L-Traps, and Texas rigged green/pumpkin creature baits on creek points, around boulders, and in riprap in 2 – 10 feet. Striped bass to 20″ are fair at night. White bass are very good on Spoiler Shads and Li’l Fishies at night and at first light. Crappie are fair to good on crappie jigs and minnows over brushpiles and tight to bridge pilings. Channel catfish are good on minnows. Yellow and blue catfish are fair to good on live perch and cut perch. LEWISVILLE Water stained; 68-72 degrees; 6.04′ low. 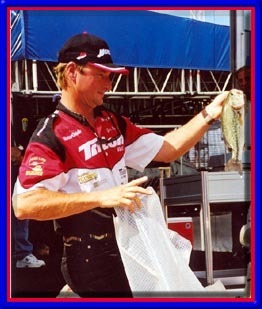 Black bass are fair on Carolina rigged french frys and Rat-L-Traps in 6-8 feet around tire breakwaters and rock riprap. Crappie are fair on live minnows and chartreuse/black jigs in 15-20 feet around bridge columns and docks with brush. White bass are good on slabs and Rat-L-Traps in 18-20 feet around mid to lower lake humps and points. Hybrid striper are fair on live shad around humps that fall abruptly from 10-25 feet. Catfish are excellent on punch bait in baited holes in 20-24 feet and drift fishing with fresh shad out from the cut in the old dam. LIVINGSTON Water fairly clear; 65 degrees; 4.06′ low. Black bass are good on spinnerbaits. Striped bass are fair on Rat-L-Traps. White bass are slow. Crappie are good on minnows. Channel and blue catfish are very good on cutbait and prepared baits. Yellow catfish are slow. MACKENZIE Water lightly stained; 64 degrees; 65.5′ low. Black bass are fair on shad-colored spinnerbaits and crankbaits along points and near timber. Crappie are fair on minnows and jigs. White bass and striped bass are fair. Smallmouth bass are fair. Walleye are fair on minnows. Catfish are good on minnows. MARTIN CREEK Water clear; 72 degrees mid-lake, 90 at hot water discharge; normal pool. Black bass are good on topwaters and Texas rigged worms with a light weight around the outside edge of hydrilla beds in 6-10 feet. Crappie are fair on live minnows around the Durgin Bridge and off the pier at the state park. Catfish are good on trotlines with small live perch and in baited holes on Bill’s Bait. MEDINA Water stained; 73 degrees; 7.17′ low. 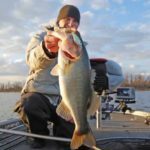 Black bass to 4 pounds are good on white buzz baits and pearl white Lucky Craft Pointers in 2 – 8 feet early, and later on June bug YUM Vibra Craws along main lake points in 10 – 16 feet. Use June bug YUM Wooly Hawgtails upriver along ledges and stick-ups. White bass are fair on live minnows and vertically jigging blue chrome Bomber slabs around main lake points in 10 – 20 feet. Smallmouth bass to 3 pounds are good on white buzzbaits and motor oil jigs along ledges and rock piles in 10 – 25 feet. Crappie are fair on live minnows and black Curb’s crappie jigs tipped with live minnows around brushpiles and standing timber at night under lights in 10 – 25 feet. Striped bass are good vertically jigging white Fle-Fly slabs in the river channel and main lake points in 20 – 35 feet. Channel and blue catfish to 10 pounds are fair on Lewis King punchbait, cut shad, and goldfish. Yellow catfish to 15 pounds are fair on juglines baited with perch and goldfish. MEREDITH Water lightly stained; 62 degrees; 23.5′ low. Black bass are fair on chartreuse crankbaits on along grass lines and rocky shores. Crappie are fair on jigs and minnows. White bass are good on live bait and crankbaits near rocky points. Smallmouth bass are fair on brown crawfish crankbaits. Walleye are fair on live bait and bottom bouncers. Channel catfish are good on minnows. MONTICELLO Water clear; 74 degrees upper end, 89 degrees at hot water discharge; normal pool. Black bass are good on topwaters along flats adjacent creek channels early, later switching to deep diving crankbaits and Carolina rigs along the Blundell and Smith Creek ledges. Crappie are slow. Channel catfish are excellent on punch bait in 10-20 feet. NASWORTHY Water lightly stained; 71 degrees. Black bass are fair on shad-colored crankbaits. Crappie are fair on jigs and minnows. Redfish are fair. White bass and striped bass are fair on crankbaits and minnows. Catfish are good on live bait. NAVARRO MILLS Water fairly clear; 2.99′ low. Black bass are slow. White bass are slow. Crappie are good on minnows. Channel and blue catfish are good on chicken livers. Yellow catfish are slow. O.H. IVIE Water lightly stained; 73 degrees; 15.25′ low. Black bass are fair on shad-colored crankbaits and Carolina-rigged shad-colored soft plastics near creek channels. Crappie are good on minnows and jigs. White bass are fair on live bait and jerkbaits. Smallmouth bass are fair. Channel catfish are fair on chicken liver. OAK CREEK Water lightly stained; 67 degrees; 18′ low. Black bass are fair. Crappie are fair on minnows and jigs. Catfish are fair on chicken liver. No boat ramps open. 4×4 vehicles can unload on the dirt road near the dam. PALESTINE Water clear; 67-72degrees; 2.75′ low. 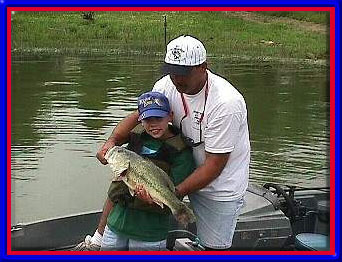 Black bass are good on 4″ worms under shaded boat houses in 6-10 feet. Crappie are fair on live minnows in 15-20 feet around standing timber on the river channel and brush piles near the end of submerged points. Catfish are excellent on prepared baits in 6-12 feet. White bass are good on slabs and Rat-L-Traps around main lake points. Hybrid striper are fair on small live perch in 20-24 feet around mail lake points. PALO DURO Water lightly stained; 61 degrees; 42′ low. Black bass are fair on live bait. Crappie are fair on jigs and minnows. Smallmouth bass are fair. Walleye are fair on minnows. Catfish are good on minnows and chicken liver. PAT MAYSE Water clear; 67-71 degrees; 3.50′ low. Black bass are good early on topwaters and Rat-L-Traps on the outside edge of grass beds in 4-6 feet. Crappie are good on Betts Jigs in 10-12 feet around man made brush piles. 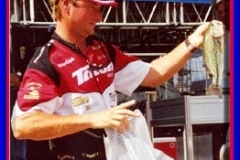 Catfish are excellent on Danny King’s Punch Bait around baited holes in 12-15 feet. White bass are fair on slabs in 20 feet around lower lake points and humps. Hybrid striper are slow. POSSUM KINGDOM Water clear; 62 degrees; 2.2′ low. Black bass are fair in Rock Creek. White bass are good in Bluff Creek and Neely’s Slough. Striped bass are fair near piers in Willow Beach area. Blue and channel catfish are fair in the upper part of reservoir. PROCTOR Water murky; 76 degrees; 3.94′ low. Black bass are slow. Striped bass are slow. White bass are slow. Crappie are fair on minnows. Channel and blue catfish are good on cutbait and stinkbait. Yellow catfish are slow. RAY HUBBARD Water stained; 67-72 degrees; 3.20′ low. Black bass are fair on topwaters and soft plastics around lily pads on the north end of the lake. Crappie are fair around the fishing barges on live minnows early and late afternoon. White bass are good on slabs around Robertson Park and the Peanut. Hybrid striper are fair on live shad, Rat-L-Traps and Sassy Shad. Catfish are good on Danny King’s Punch Bait in holes baited with soured grain in 15-18 feet. RAY ROBERTS Water clear; 68-72 degrees; 2.65′ low. Black bass are good early on topwaters over grass beds, later switching to Carolina rigged soft plastics in 12-20 feet. Crappie are good on tube jigs in 12-15 feet around the mouth of major creeks. White bass are good on small prop-type topwaters and slabs in flats near the mouth of major creeks. Catfish are excellent on punch bait and fresh shad in 12-20 feet. RICHLAND CHAMBERS Water stained; 67-72 degrees; 3.80′ low. Black bass are slow. White bass are excellent on slabs and topwaters around standing timber in the Hickey Island area and out from Pelican Island. Hybrid striper are good on large slabs and topwaters on the 309 flats – limited top water schooling action occurring early. Crappie are slow. Catfish are good on Danny King’s Punch Bait and fresh shad in 15-20 feet. SAM RAYBURN Water slightly stained; 79 degrees; 4.42′ low. Black bass are fair to good on watermelon/red and watermelon seed crankbaits, spinnerbaits, Rat-L-Traps, and soft plastics. Crappie are fair on live shiners and white/blue fleck tube jigs. Catfish are good on live bait, frozen shrimp, and cutbait. SOMERVILLE Water murky; 2.44′ low. Black bass are slow. Hybrid striper are slow. White bass are slow. Crappie are slow. Channel and blue catfish are slow. Yellow catfish are slow. SPENCE Water lightly stained; 69 degrees; 45′ low. Black bass are fair on white spinnerbaits. Crappie are fair on minnows and jigs. White bass are fair. Striped bass and hybrid striper are fair. Catfish are fair on minnows. STAMFORD Water lightly stained; 67 degrees; Black bass are fair on white spinnerbaits and live bait. Crappie are fair on jigs and minnows. White and striped bass are fair on live bait. Catfish are fair on minnows. STEINHAGEN 2.61′ low. No report available. STILLHOUSE Water clear; 70 degrees; 0.40′ low. Black bass are fair on pumpkinseed and watermelon seed soft plastic worms and lizards, and on topwaters. White bass are good on minnows near Long Bridge. Smallmouth bass are fair on minnows. Crappie are slow. Channel and blue catfish are good on minnows, chicken livers, shrimp, and hot dogs. Yellow catfish are slow. SWEETWATER Water lightly stained; 65 degrees; 31′ low. Black bass are fair on white/chartreuse spinnerbaits. Crappie are fair on minnows and jigs. White bass are fair. Catfish are fair on live bait and stinkbait. TAWAKONI Water stained; 67-71 degrees; 6.50′ low. Black bass are fair on Rat-L-Traps and soft plastics around boathouses with brush. Crappie are fair on live minnows in 12-15 feet off the fishing barge at Duck Cove Marina. Catfish are good on Danny King’s Punch Bait around baited holes in 18-20 feet all over the lake. White bass are excellent on 1 oz. white or chartreuse Holiday Slabs. Striped bass and hybrid striper are good under the birds on 2 oz. chartreuse or white Holiday Slabs, Sassy Shad and large pearl Chug Bugs. TEXOMA Water clear; 67-72 degrees; 1.20′ low. Black bass are fair on Texas rigged worms and Rat-L-Traps around docks with heavy brush. Smallmouth bass are good on crawfish pattern deep diving crank baits along lower lake rocky points. Crappie are fair on jigs and minnows around docks with brush in 20 feet. Striped bass are excellent on topwater plugs and live shad. Blue catfish are good on punch bait and fresh cut shad in 15-22 feet. TOLEDO BEND Water slightly stained; 78 degrees; 8.51′ low. 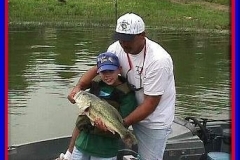 Black bass are fair on chrome/blue spinnerbaits and crankbaits, and on Texas rigged soft plastic worms over grass beds and brushpiles in 10 – 20 feet, and slow to fair on silver spoons and slabs. Crappie are fair on live minnows. 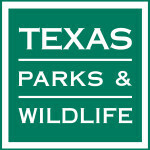 TRAVIS Water clear; 76 degrees; 15.00′ low. Black bass are good on purple soft plastic worms, white spinnerbaits, and chrome topwaters. Striped bass are slow. White bass are slow. Crappie are slow. Channel and blue catfish are fair on nightcrawlers and bloodbait in 20 – 35 feet. Yellow catfish are slow. WALTER E. LONG Water clear; 71 degrees. Black bass are fair on minnows and on watermelon/red soft plastic worms and lizards. Hybrid striper are fair on live shad and striper jigs. White bass are slow. Crappie are good on minnows. Channel and blue catfish are good on live bait, nightcrawlers, frozen shad, and stinkbait. Yellow catfish to 40 pounds are good on live bait. WEATHERFORD Water stained; 67 degrees; 5.2′ low. Black bass to 10 pounds are good (Saturday morning bass tournaments have begun). Crappie to 1.5 pounds are fair on minnows and jigs. Channel catfish are slow. White bass are poor. Bream are good on worms. Although the water is low, boat ramps are still usable (with caution). WHITE RIVER Water lightly stained; 67 degrees; 22.35′ low. Black bass are fair on Carolina-rigged dark soft plastics worked slowly around stickups and rocky points. Crappie are fair on jigs and minnows. Walleye are fair on live bait. Channel catfish are good on minnows. spoons, and crankbaits. Striped bass are slow. White bass are slow. Crappie are fair on live minnows and blue/green and watermelon tube jigs. Catfish are good on shrimp, stinkbait, and cutbait. WICHITA Water muddy; 60 degrees; Full at spillway. Crappie are slow. White bass and hybrid striped bass are fair on large minnows and white twister-tails along dam and near spillway. Channel catfish are fair on bait shrimp or punchbait. North side public ramp is temporarily closed for maintenance. WRIGHT PATMAN Water clear; 67-71 degrees. Black bass are good on soft plastics and spinnerbaits in 6-10 feet around lay down logs and shoreline vegetation. Crappie are fair on tube jigs and live minnows in 12 feet around the fishing barge at Kelly Creek Marina and main lake brush piles. Channel catfish are good on trotlines and on rod and reel in 10-15 feet on punch bait.